It's already October, so my donabe spirit is gearing up further for hot pot dishes. I picked up a nice looking small size napa cabbage from a market. So, I cut it into quarters and let them sun-bathe for almost full day. The leaves were not completely dry, but they were wilted and the flavors has become intensified by sunbathing. Because the size of the napa cabbage shrink after sun-bathing, they become easier to cook down in a pot. I also made cold-infused kombu & dry shiitake mushroom dashi stock by soaking them in cool water for overnight. 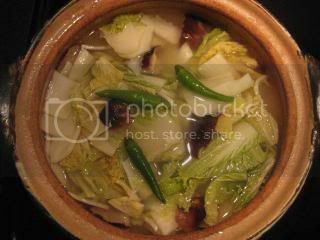 Once the napa cabbage is ready, this hot pot is very easy to prepare. I used classic-style Iga-yaki donabe, "Hakeme" (medium size) for this dish. Dashi stock was combined with sake, cut napa cabbage, and rehydrated dry shiitake (from making dashi stock) and a couple of Japanese green chili peppers. 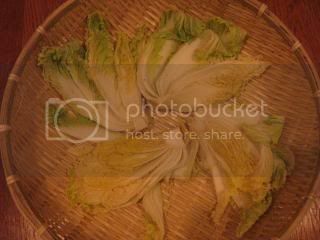 Once the napa cabbage are further wilted, abura-age (fried tofu pouch) pieces were added. Simmer for 30 minutes. While the napa cabbage and other ingredients were simmering, I made pork meat balls. They were added to the donabe, then seasoned lightly with soy sauce and cooked for additional 15 minutes or so. The dish was ready. 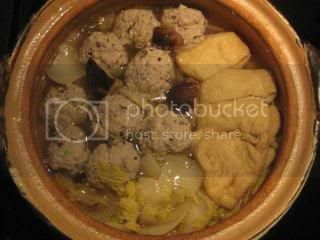 This dish is about enjoying the sweet and soft napa cabbage after sun-dried and slow cooked, along with the fluffy meatballs ("niku dango"). Try to save most of the broth at the end, so that you can add the cooked rice to the broth to make quick porridge ("ojiya") as a final "shime" course. (1 day before) In a bowl, combine the water, dry kelp, and dry shiitake mushrooms. Soak overnight in refrigerator. Remove the shiitake mushrooms. Cut off and discard the stems. Slice each cap into half. Set aside. Lay the quartered napa cabbage in a basket. Fan out the leaves and let them sun-dry for half day to full day. Rinse and cut into 1" (2.5 - 3 cm) thick. Discard the bottom core part. Set aside. In donabe, combine the above infused water (with the kelp), sake, shiitake, and napa cabbage. Cover and bring to simmer over medium-low heat. Remove kombu. Add the abura-age and continue to simmer for 30 minutes. Meanwhile, in a bowl, combine the ingredients for the meatballs. Knead by hand until smooth. 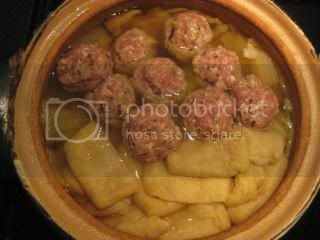 Form the meat mixture into ping pong size balls by hand and add to the donabe. Add the soy sauce. Cover again and simmer for 15 minutes or until the meat is cooked through. Serve the cooked ingredients into individual bowls with a little broth with some yuzu-kosho as a condiment. *If you have enough leftover broth, re-heat it and add about 2/3 as much volume of cooked rice. Stir. Whisk 1-2 egg in a bowl, and drizzle over the rice. Cover and cook for 1 minute or so. Serve immediately.